Have the intention of connecting with people by building rapport and finding common ground with them. Build rapport before launching into giving feedback or stating a need. People who are socially adept find this process easy and natural. Others say that they don’t find what they may call “small talk” easy. Building rapport helps the person you are talking with to feel at ease and open to you and the conversation. By smiling and showing some interest, you help others feel safe and understand that you are not likely to hurt them. Inquire about or share information about something you have in common. Topics could be the weather, the commute, sports, children, vacations, something happening in the news, a company development, or health. In workshops, I ask people to share something about themselves with the group. As we share about ourselves, we are a bit vulnerable. Invariably, in these brief conversations, participants begin to build rapport and feel connected. We often feel alone or feel that others don’t connect with what we do. When we build rapport, we feel less alone and more connected with others. It is human nature to feel connected when we have shared a similar experience. One participant felt connected with someone who went to his high school, even though they had never met and went at different times. They felt they shared similar experiences. We want to be understood. Even on small issues, having some shared experiences helps us feel understood and see another as more of a friend than a foe. We look for these connections naturally. When we first meet someone, we look for common ground. For instance, when we learn we both have young children, we relax a bit since we feel more understood by this stranger. Strangers can easily talk about the weather since both are experiencing it. Even a brief comment about how nice it is finally to see the arrival of spring creates a sense of connection in an elevator conversation. Did you see the television show last night; can you believe the news? How about that player and sports team? I understand from Joe that you love photography, too. It sounds like your children have the same musical interest as mine. I see from the bag you’re carrying that you also go shopping at…. 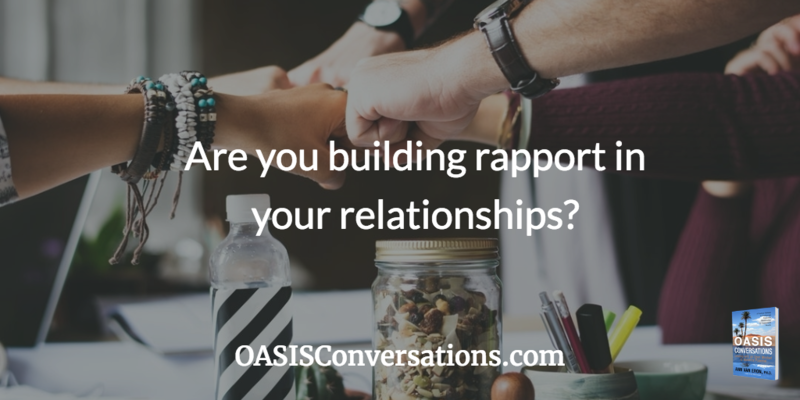 You don’t always have to build rapport immediately before an OASIS Conversation. If you make the effort to talk with a person and connect with her regularly, then when it is time for your conversation, the other person will already know you are friendly. If a power differential exists between you—you are the person’s manager, for example—remember to show interest in the other person. You will appear more human and show respect for the other person. People notice managers who show no interest in them and only see staff members as tools for getting work done; then they have less energy for supporting the manager. How do you determine how much small talk is useful? Pay attention to the other person’s behavior. Some people only like a little small talk before they will start to squirm or switch the subject to work matters. Follow their cue. Others will not seem relaxed and need more conversation to build rapport. Notice when a shift in energy occurs; then it is okay to shift subjects. This skill can be learned by carefully observing others. This excerpt was taken from my book OASIS Conversations. This entry was posted in Building Rapport, Communication, intention, Mindfulness, Mindset, Perspective by Ann Van Eron. Bookmark the permalink.